Martin David Black is a 64-year- old Visual Arts teacher at Senn High School who has been teaching for 27 years. 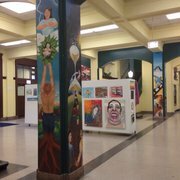 Black taught many schools on the west side of Chicago before coming to Senn. He also teaches more than just art, Black also teaches swimming, and coaches the Swim Team here at Senn. Like all teachers Black has to deal with difficult students. Usually, he does not tolerate bad behavior, but there are students who attempts to push his buttons, “Sometimes the behavior is initiated just to see what I’ll do, and they’re just pushing the boundaries just to get a reaction,” he said. Black looks forward to continue teaching the students of Senn and building on their already vast knowledge of so many things, not just art.